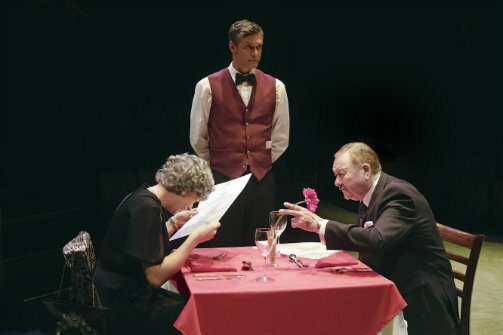 L-R: Elizabeth Boag, Stephen Billington, and Russell Dixon in Confusions. Photo by Tony Bartholomew. BOTTOM LINE: A well-presented and funny take on falling in and out of love that touches upon fidelity, commitment, longing, and loneliness. The five intertwined skits that comprise Alan Ayckbourn’s Confusions are by turns hilarious and poignant. Fast-moving and deftly acted, the five-character ensemble whips through a myriad of scenarios. The first, Mother Figure, introduces Lucy (Elizabeth Boag) as an overwrought mother of three. Her traveling salesman husband is rarely around and she has long ignored both the doorbell and the constantly ringing telephone, not wanting to be bothered. Late one evening, however, just as she is about to kick back and relax before bed, her nosy neighbors (Charlotte Harwood as Rosemary and Stephen Billington as her husband Terry) barge into her flat through the unlocked front door. What ensues is not only very funny, but pointedly jabs at gender norms, domestic propriety, and the frustrations of parenting. The second, Drinking Companion, introduces Lucy’s womanizing husband Harry (Richard Stacey), and we watch as he unsuccessfully attempts to woo two females (Elizabeth Boag and Charlotte Harwood) in a hotel bar. Physical humor is abundant as a hapless waiter (Stephen Billington) helps the women escape from this wanna-be Lothario. We next see Stacey and Harwood in a restaurant. She has just returned from a vacation—he was too busy to get away from work, he said—and they are having a reunion dinner. But wouldn’t you know it: here they are, in a trendy bistro without the kids, and seated nearby are Stacey’s boss (played by Russell Dixon) and his wife (Elizabeth Boag), people they are less than eager to engage. And that’s the least of it. As the evening unfolds both couples begin to fight—while Billington, again as a waiter—attempts to unobtrusively serve the food and drink each couple has ordered. Called Between Mouthfuls, the vignette traverses several recognizable minefields with droll wit, fanciful banter, and more-than-a-few verbal daggers. Gosforth’s Fête follows. About the impact of infidelity, the slapstick scene serves as a showcase for the full ensemble. Similarly, the complete cast participates in the closing piece, a touching look at loneliness called A Talk in the Park. In it, Ayckbourn suggests that despite our solitary existence, all people have an innate need for connection, and despite messy foibles and confusion about our innermost desires, the big and small dramas of everyday life continue to propel us into one another’s arms. Although this is certainly not a deep revelation, it doesn’t much matter. Confusions is entertaining, and although a few sharp barbs about gender and monogamy are exchanged, there are more laughs than insights. Overall, it’s a fun piece of theater. The sets (by Michael Holt and Veronica Aglow) move easily to allow for rapid-fire scene shifts and to a one, the acting is pitch-perfect. Ayckbourn, the playwright and director, is at the top of his game, and at age 76 is still writing—his 79th play, 2015's Hero's Welcome, runs in rep with Confusions. Confusions is written and directed by Alan Ayckbourn. Set Design is by Michael Holt. Lighting Design is by Jason Taylor. Veronia Aglow is the Stage Manager. The cast is Stephen Billington, Elizabeth Boag, Russell Dixon, Charlotte Harwood, and Richard Stacey.